How many stems should I get? You'll need between 10 and 25 stems for a pint sized mason jar with a narrow mouth, which is 2.5". 10 stems will be a delicate look, 25 will be a full, bountiful look. You can use that metric to help estimate how many stems you'll need for your different vessels. For example, if you're doing a vase with a 5" opening for a centerpiece, you'd need about 30-50 stems. But what if I want big blooms like sunflowers? Do I need fewer stems per vase? Yes! Big blooms mean fewer stems per vase, since they take up more space. How much foliage should I get? We'd recommend getting 50% flowers and 50% foliage overall. How many stems for a bridal bouquet? We'd recommend at least 75 stems for the bridal bouquet. You may not use them all, but you can have your pick of what to use for the most special piece of the day. What holds up well out of water, in a boutonniere? Any everlastings- rosemary, strawflower, eucalyptus, statice, gomphrena, craspedia, etc. all look great in a boutonniere out of water. 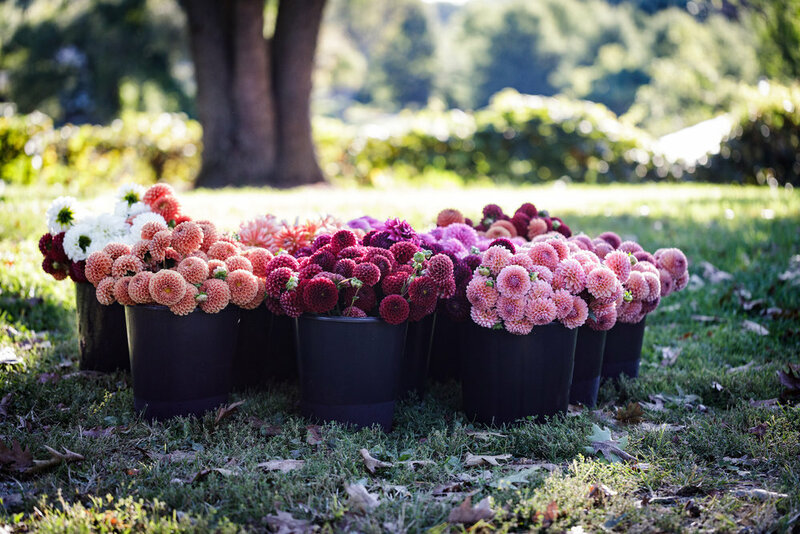 For a day or so, dahlias, zinnias, and any other flowers EXCEPT for herbal foliage will also look great! Keep your boutonnieres in the fridge until the moment they get put on for the ceremony or pictures! You’ll only need about 5 stems for the boutonniere. Will you give me advice on choosing my flowers? For Queen Bee flowers, can I skip the farm tour and just order flowers from the emailed availability list? How should I keep the flowers before the wedding? A cool place, inside, and out of sunlight will do! An air conditioned living room, bedroom, etc. are fine. Do NOT put flowers in refrigerators or freezers, with the exception of boutonnieres, which can be put in tupperware or wrapped and placed in the fridge for freshness. How many days before the wedding should I get my flowers? 1 or 2 days will be perfect. Do my vases need to be clean? YES!! You can add a drop of bleach to the water in each vase to kill any bacteria.